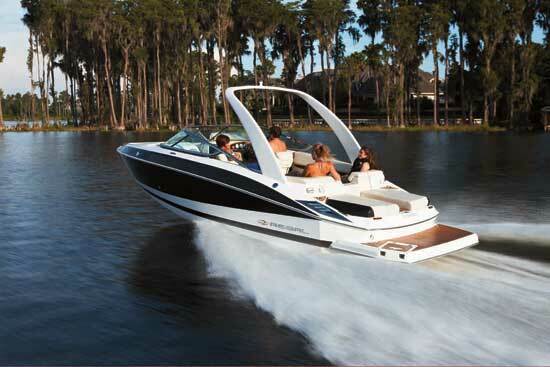 Regal Commodore 4260: Escape the ordinary in Regal's new flagship. 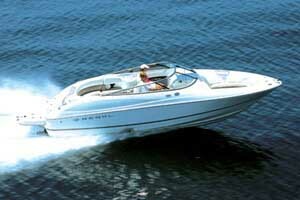 On open water, the 4260 was a well-mannered performer. 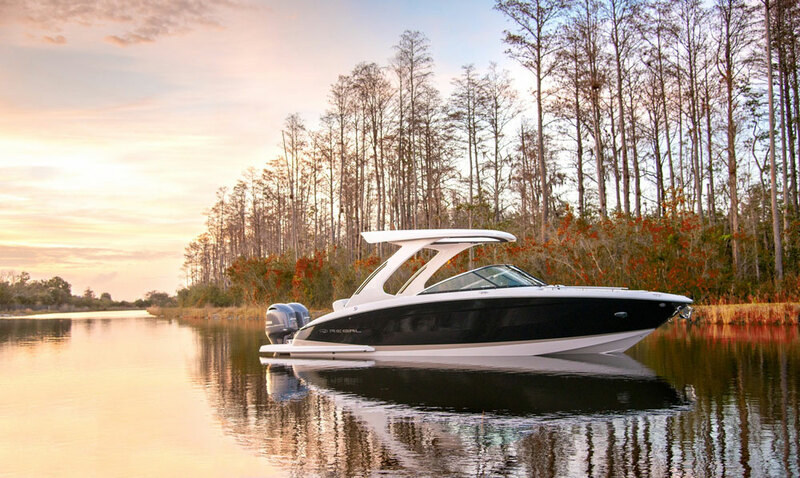 The Regal Commodore 4260 — Regal Marine's new flagship — is no ordinary boat. We found that out as soon as we headed down the docks on the day of our sea trial. The dockmaster said the 4260 was at the end of the pier — a very long pier, at that. 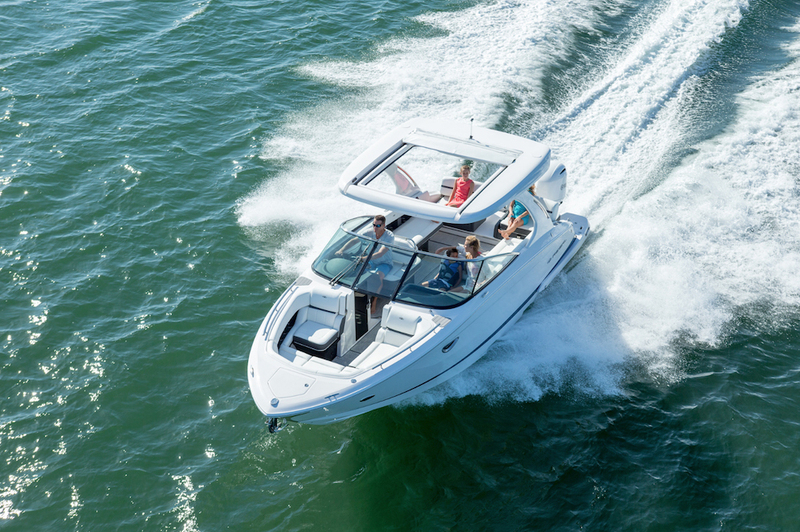 About half way there, we couldn't help but notice it: The 4260, with its distinctive two-tone custom hull option, stood out among the nondescript white boats that surrounded it. The 4260's sleek lines were crowned with a hardtop, supported by a reverse arch. The look was elegant and distinctive. 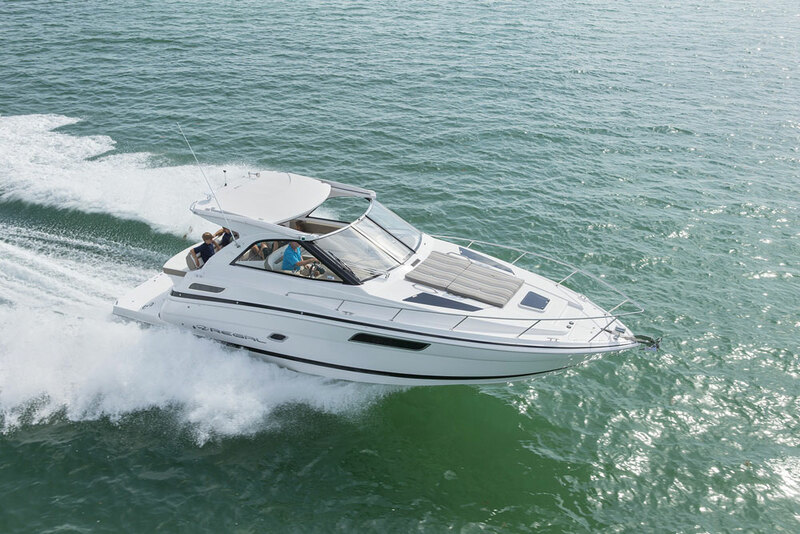 The 4260 is the largest boat Regal has ever built, and the company has put considerably more than bulk within the boat's dimensions. There is a level of craftsmanship and luxury amenities that is over and above what you expect to find from even this quality builder. For example, one of the first things you'll notice as you approach the boat is the substantial windshield frame. Its stainless steel components are nearly double the size of those found on other boats. There's a reason for this, as we would soon see. We tested the 4260 near Miami, on a not-so-idyllic spring day. There was a strong east wind, and the outgoing current was moving swiftly as low tide neared. This created very choppy conditions in Baker's Haulover Inlet, just north of the city. Smaller boats were struggling with the waves, but the 4260 didn't seem to mind them. It smoothly sliced its way through, on its way to the ocean. You might expect some creaking and groaning in these conditions, but the 4260 remained silent. The only sounds to be heard were the engines and the water. It was proof of the value of those substantial windshield frame members — not to mention the many other well-planned and solidly assembled components on board. 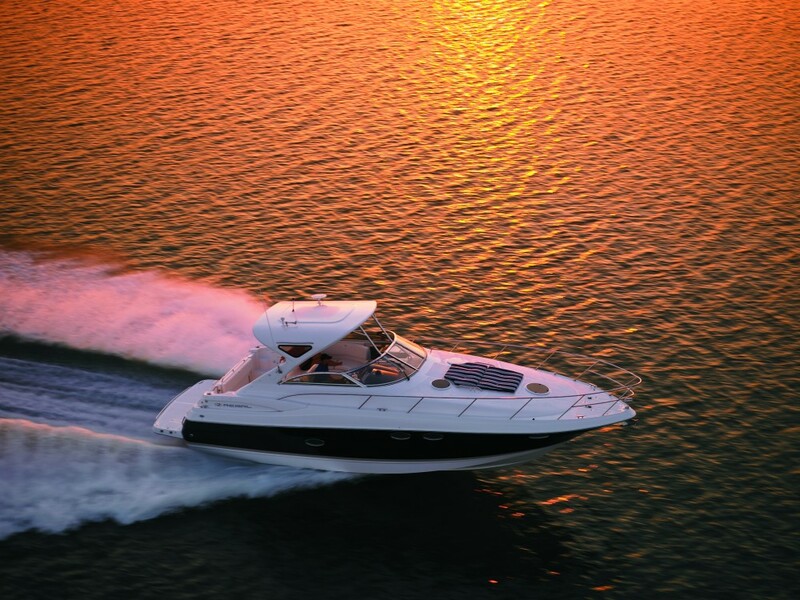 On open water, our 4260 was a well-mannered performer. Our test boat's optional twin 480 hp Volvo Penta TAMD 75P diesels delivered smooth acceleration throughout the power curve. From a standing start, the boat needed its trim tabs to keep the bow down — but once on plane, we could dial them back. Regal's Ocean Trac hull provided stability in turns and ran straight in the 2- to 3-foot waves we encountered. Our boat's twin Volvo Penta diesels powered the 4260 to a top speed of 33.5 knots. Our economical cruising speed was around 25 knots, at 2,000 rpm. Back at the dock, we took time to thoroughly examine what makes the 4260 such an exceptional boat. The fit and finish is superb — inside and out. Regal's attention to detail has always included a long list of amenities and creature comforts, from including wastebaskets both topside and belowdecks to providing grabrails in just about any place where you'd instinctively grab to hold on. When was the last time you saw a ship's bell on a new boat? The 4260 has one — and it's standard equipment. Another thoughtful touch: While most boat builders just put a sunpad on the foredeck, Regal puts hinged panels there, so you can sit up as well as lie down. There's one for each side of the pad. The cockpit has two seating areas. A U-shaped lounge extends along the port side, abaft the windshield. It has a removable table at its center that can be lowered to create another sunpad. Immediately behind it, there's an aft-facing settee. A third settee, facing forward, is built into the transom. This, too, can become a sunpad. 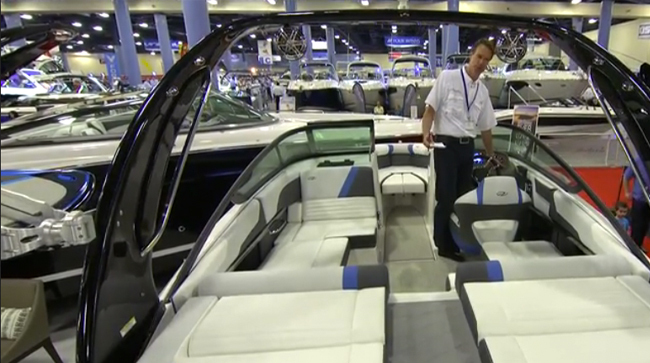 Regal's European-style sundeck option converts a bench seat into a relaxation zone. Access to the swim platform is through gated walkways on each side of the transom seat. There's enough room to stow an inflatable boat here — but for the ultimate in water toy stowage, ask about the 4260's optional hydraulic swim platform. You can have full galley facilities in the console along the starboard side of the cockpit, with the addition of an optional propane barbecue grill. There's a two-level Corian countertop for food preparation, and it holds a standard sink with hot and cold water. An under-counter refrigerator/ice-maker is also standard. The extra-wide helm seat is electrically operated and has a flip-up bolster for convenient stand-up operation. The helm console is compact but well arranged, and it includes space for one large-screen electronics display. A Raymarine VHF radio and a depth sounder are standard equipment, and so is a cockpit stereo system with four speakers and two remote control heads. There are two ways to gain access to the 4260's engine compartment. A day hatch at one end of the aft-facing settee on the port side of the cockpit lets you get in to do quick fluid checks. An electrically powered hatch raises a large section of the aft cockpit deck, for more involved maintenance tasks. There is a provision on the underside of the hatch to store the cockpit table. Diamond-plate decking along the centerline and across the aft end of the engines provides sure footing inside the compartment. The most striking feature of the 4260's interior is the exquisite expanse of high-gloss cherry woodwork throughout. Regal imports the finely crafted wood from Italy: The pieces arrive at the Orlando factory finished and assembled, ready to drop in place. Fit and finish throughout is excellent. We could find no evidence of trimming to fit or of touching up dents and scratches. Everything is obviously made to exacting tolerances and assembled with craftsmanlike attention to detail. The galley runs along the starboard side of the main saloon. It offers a stainless steel sink, a microwave oven, a 7.4-cubic-foot refrigerator/freezer, a coffeemaker and a two-burner electric stove that hides under the Corian countertop when it is not in use. There's a settee along the port side of the saloon, with an oval-shaped solid wood table in front of it. The table is hydraulically operated and can be lowered to create a berth. A 20-inch flat-screen television is mounted on the bulkhead, forward of the galley. It's a standard feature on the boat — and so is a 13-inch flat-screen television in the forward stateroom. A DVD player and a premium audio system are also standard features in the saloon. The master stateroom is forward. It offers a queen-size berth at its center. Cherry joinery is the main accent here, as well. A hanging locker is located to port, a smaller cabinet is to starboard and a row of cabinets is provided overhead along each side. The master head compartment features a separate shower stall and a large Corian vanity top. Another thoughtful Regal touch is a hair dryer — provided as a standard feature. The aft stateroom has more than 6 feet of standing headroom at the foot of its twin berths. It has its own head compartment, containing a shower and a marine toilet. A vanity, sink and dressing mirror are provided in the stateroom, built into the cabinetry along the port side. A wood armoire in this area holds the optional washer/dryer combo. With size, luxury accommodations and style that are truly worthy of the name "sport yacht," Regal's new Commodore 4260 sets the bar a little higher for the competition — and gives Regal a lot more to offer the midsize yacht buyer. Air conditioning; cockpit carpeting; cockpit ice-maker/refrigerator; spotlight; windlass; bottom paint; central vacuum; generator; VacuFlush heads; 20-inch television in saloon and 13-inch television in master stateroom; Raymarine VHF radio and depth finder. Bow thruster; washer/dryer; gas grill; custom gelcoat; Glendinning Cablemaster; hardtop; hydraulic swim platform; Raymarine electronics package. 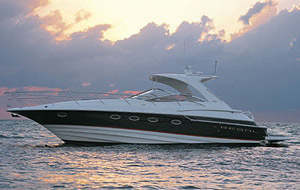 Fiberglass hull utilizes Regal's proprietary Ocean Trac design.